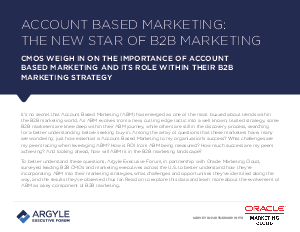 A recent Argyle survey found that nearly 60% of marketing organizations currently use some form of Account-Based Marketing (ABM), while 28% plan to use it in the near future. This shows the rising importance of ABM in the marketing mix. However, ABM does have its challenges. Almost 30% of the same respondents claimed that maintaining personalized, but consistent interactions with prospects was the most prominent challenge in ABM. For more insight on how marketing executives are optimizing ABM, download this survey.